Due to hard landing or failed ground handling fuselage or structural damages may occur. With the GOMOLZIG Engineering Team, Minor or Major Repairs can be certified. Damaged landing gears due to hard landings or fatigue can be repaired in accordance with our approved Repair procedures. For further information please contact us here. 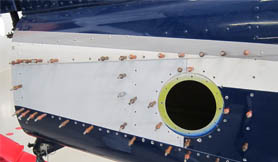 The amount of unpredictable damages of aircraft can not be covered by the manufacturers completely. The Scope of GOMOLZIG’s Approvals permit us to develop and certify a wide range of Major and Minor repair solutions. Component parts of repairs can be supplied separately, please contact GOMOLZIG for details. Therefore, feel invited to click here to contact us for more information.